[2 mins. 58 secs.] Another episode of the podcast dedicated the New York Film Festival 55th edition. First up, a conversation with the found of the PBS series, American Masters, Susan Lacy. Lacy has since gone off on her own to direct and produce independent documentaries. Her latest, "Spielberg", is an intimate portrait of the filmmaker Steven Spielberg which premiered and screened at the New York Film Festival. Tonight, Saturday, October 7th, the film premieres on HBO at 8PM. Through exclusive interviews with actors, family, and the filmmaker himself, this unprecedented documentary pulls back the curtain on the remarkable career of Steven Spielberg. Joining Susan is producer Jessica Levin. [25 mins. 35 secs.] 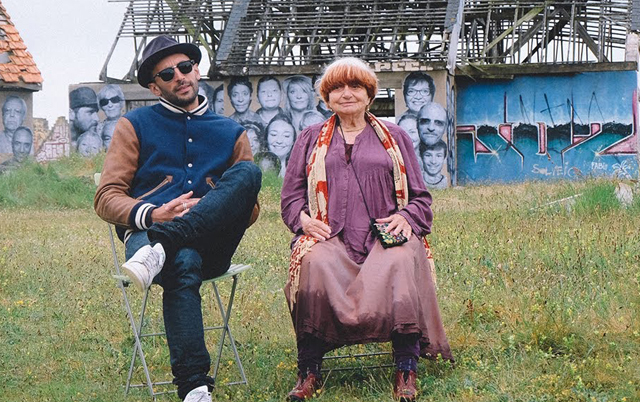 Nouvelle Vogue icon Agnès Varda ("The Gleaners and I") has a conversation with her latest filmmaking collaborator, photographer/muralist JR, about their work "Faces Places" which just had a couple of screenings at the New York Film Festival and which is currently having a theatrical run at the Quad Cinema & Lincoln Plaza Cinemas in New York City. In this intimate conversation for the podcast, the two discuss their journey through rural France and the unlikely bond that formed between the two of them.